Medellín, Colombia is much more than what you see on the show Narcos, while this city was once a place where no tourist would come, it has evolved into one of the hottest tourist destinations in all of South America. And it’s for a good reason: there are a lot of awesome things to do in Medellin, Colombia. I’ve lived in Medellin on and off for a number of years now. It’s like my home away from home. Here’s a list of things I think everyone should see and do in Medellin, and also one thing that tourists should definitely NOT do. 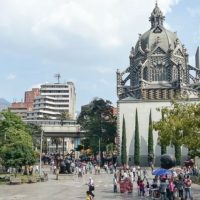 This list is directed at the short-term visitor, to provide them with a complete and varied view of where to start in Medellin, but if you plan to stick around for the long-term, there are tons of events and activities to keep you busy here. These things to do in Medellin are in no particular order, so if you’re looking for something a little more organized and structured, then check out my article on 3 days in Medellin. On to my definitive guide of things to do in Medellín, Colombia… Since this is such a long list, I’ve also included a Top 10 wrap-up at the end. 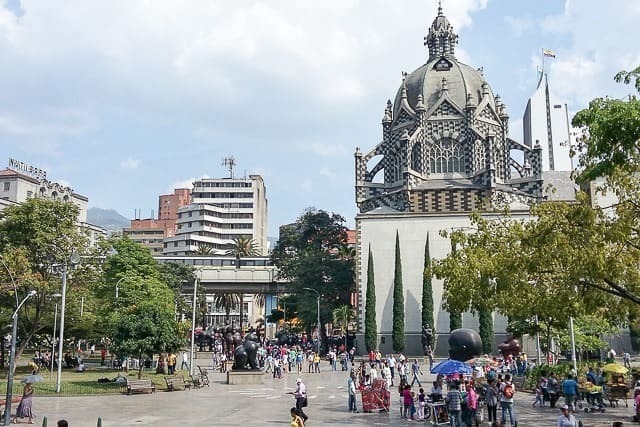 Plaza Botero is perhaps the most emblematic of all of Medellin’s tourist attractions and is beloved not only by Medellin but throughout all of Antioquia (the regional department or state). 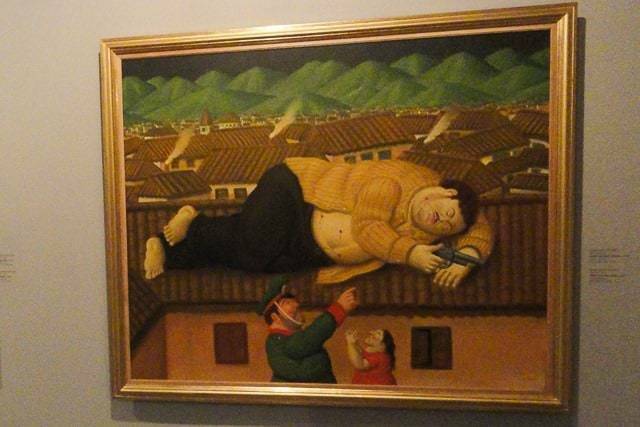 Fernando Botero is Medellin’s most famous artist, who is internationally renowned for his plump or fat figures. Plaza Botero is full of his larger than life statues and is a free attraction in the city center. The lovely Rafael Uribe Uribe Palace of Culture sits on the square, along with Medellin’s famous metro (another source of pride), and Coltejer Tower looming above. 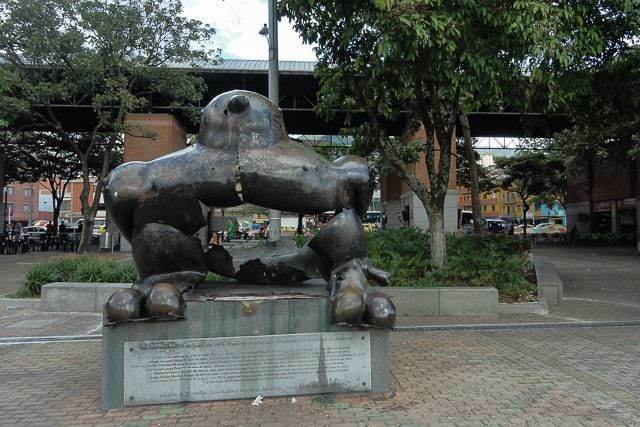 Right along Plaza Botero is the Museum of Antioquia, the most important and significant museum in Medellin. 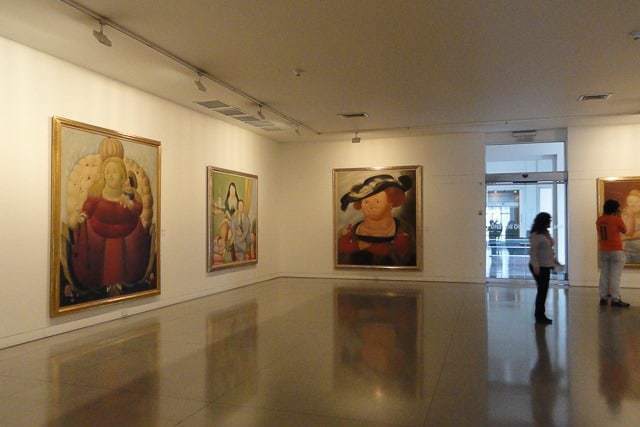 Inside you will find a large collection of Botero’s most famous paintings along with a number of his sculptures. 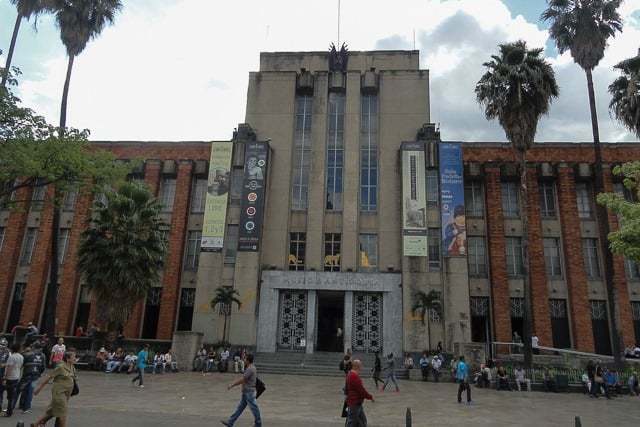 The museum also holds exhibits from a number of international artists, early art from the conquest of the Americas, and other important cultural attractions. The museum has a modest entry fee but is absolutely worth doing while you are downtown. Speaking of downtown, the free walking tour (in English) put on by Real City Tours is one of the best things to do in Medellin for new arrivals. The tour itself is free, but they ask for a donation at the end, whatever you want to pay. Downtown Medellin can be a bit rough and intimidating, especially for new visitors who usually stay in nicer neighborhoods like Poblado or Laureles. So the walking tour is an excellent introduction to get your bearings. 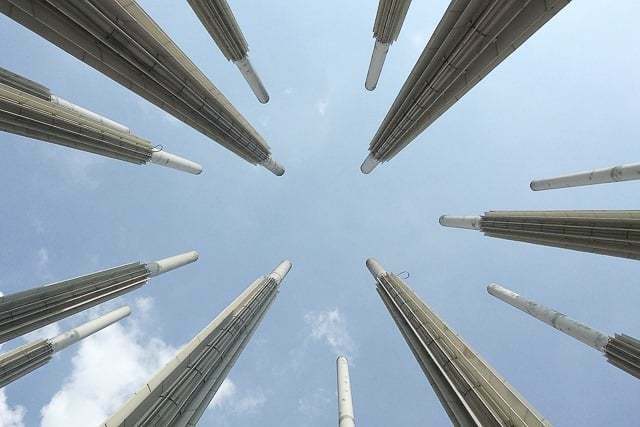 The walking tour is about four hours long and takes you through some of the highlights (and lowlights) of Medellin’s tumultuous history as well as passing through some of the main downtown Medellin attractions ranging from Alpujarra, Parque Berrio, Plaza Botero, and more. I only wish I would’ve taken the tour as soon as I arrived on my first visit to Medellin — it is best to do this on your first full day in Medellin. Read more about the other Medellin tours that I recommend. 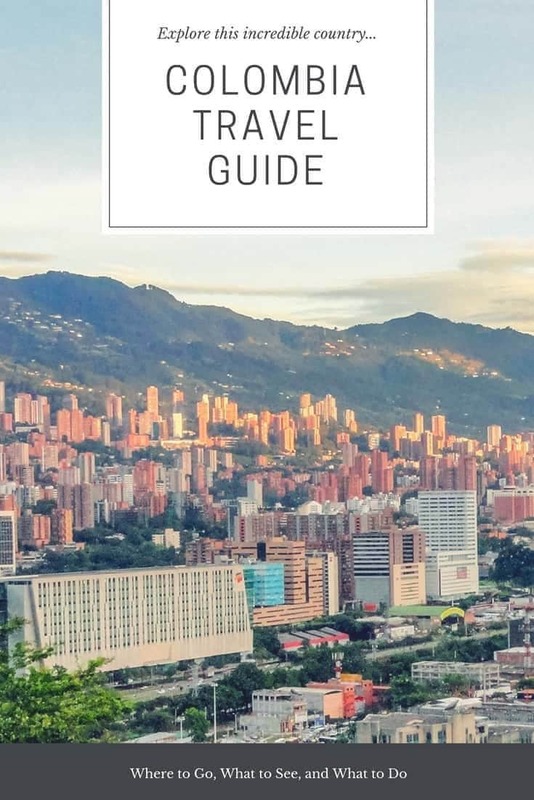 If you’d rather explore it on your own, be sure to check out my comprehensive guide to the Medellin Centro which covers all the highlights of the walking tour and plenty more that they don’t, including places to go, where to eat and drink, safety, and much more. This free tour is a great way to get a feel of the city from a local perspective because honestly, this city is best explored like a local. If you don’t know anyone in Medellin, I’d recommend contacting this company to have a local Colombian plan your trip. I’ve organized a 5% discount with them for all my readers. Be sure to visit Plaza de San Antonio, an expansive public plaza located on the southern end of the downtown core, and directly adjacent to the station that connects the two metro lines. While the plaza itself is nice, the real reason to come here is to see the Botero statue that was blown up. In 1995, 22 pounds of dynamite were stuffed into the bird statue before a large concert took place. It was detonated in the midst of the festivities and killed 30 people and injured 200 or more. The bomb was attributed to FARC who were unleashing chaos on the local residents. Botero asked that they leave the statue in San Antonio as a reminder of the violent history that has plagued this city. A new bird sits beside the old bombed out shell, as a vision Medellin’s peaceful future. Ah yes, the world famous Colombian coffee. No visit here would be complete without savoring some of the local coffee. 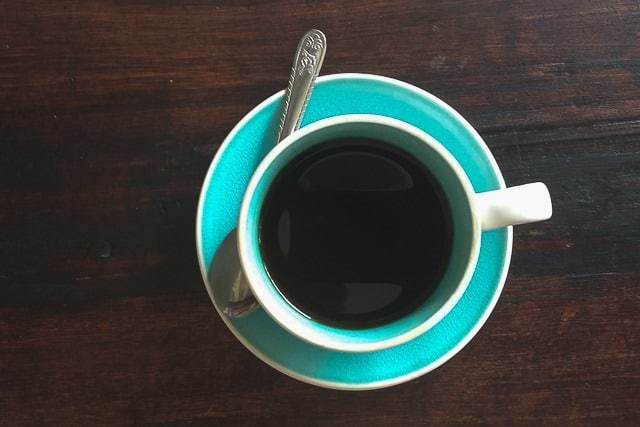 Colombians themselves most commonly drink tinto — small cups of instant coffee loaded with sugar — while the majority of the best coffee is exported abroad. BUT, coffee culture has been on the rise here and a number of local chains and independent coffeehouses have sprouted up. The most well-known is most certainly Juan Valdez, which is worth going to. But I’d also recommend checking out El Pergamino in Poblado, or Algarabia or Rituales in Laureles for a more indy coffee scene. I’d highly recommend doing a coffee cupping here in town as well to learn more about the precious bean we all know and love. The Botanical Gardens are located north of El Centro, in an area known fittingly as Zona Norte. This space isn’t massive, but it’s the size of at least a dozen city blocks — a small green refuge in a big bustling city. I love wandering around the little lake and looking for birds or iguanas, going to the small butterfly house, or just wandering beneath the towering roof of the orchid exhibit. 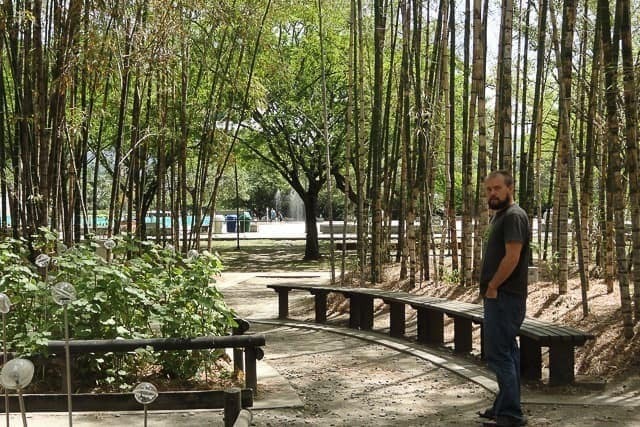 For those craving a little zen and tranquility, Jardin Botanico is one of the best in Medellin. Oh, and it’s 100% free! Parque Explora is an interactive science museum located just beside the Jardin Botanico. Now, I know some people might think a science museum would be boring, but Medellin does museums really well. As I said, the museum focuses on fun and interactivity, so they’ve got hands-on activities that demonstrate everything from physics to neuroscience, to communication and perception itself. It’s fun to feel like a kid again and wander through the exhibits. They also have a sizable aquarium and a terrarium with some of the strange creatures that inhabit this tropical country. 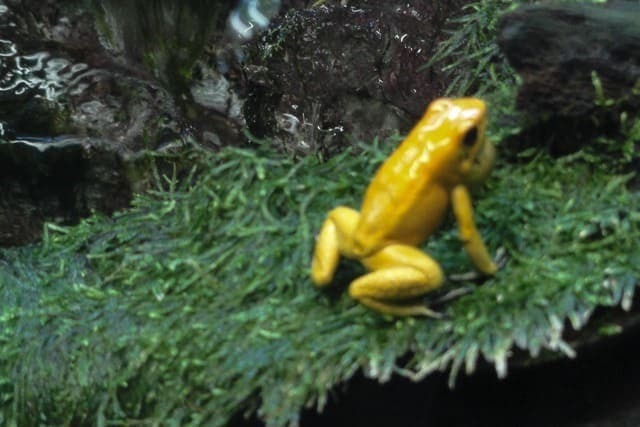 The golden poison dart frogs are quite cool, the most poisonous frogs in the world and which come from Colombia. 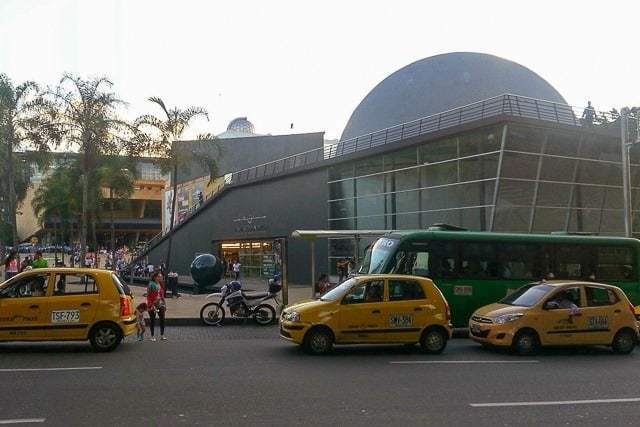 The Planetario de Medellin is located directly adjacent to Parque Explora and the Botanical Garden and makes for an excellent addition to a busy day in Zona Norte. It is administered by Parque Explora, which means the focus is on interactivity with education. Here you’re not just reading about the gravitational pull between planets or the Coriolis effect, but seeing how it works in an interactive way. The highlight, of course, is the theater located under the massive dome. The movies will take you on an immersive journey through space. There are also special events held here on occasion, like when they had the Pink Floyd: Dark Side of the Moon show here, which was really cool! Keep your eyes open for things like that. Pueblito Paisa is a mock pueblo (town) like you would find in the countryside, but located in the heart of Medellin atop Cerro Nutibara. The “village” itself is quaint and somewhat interesting. It’s a great place to buy souvenirs for friends and family. But the real attraction for me is taking in the 360 views of the city, right from the center. You can see the downtown cluster, the sprawling neighborhood of Belen, or the many glistening towers of Poblado and beyond. I’d recommend coming here at around 5 pm so you can take in the city during the daylight, catch a (hopefully) beautiful sunset over the mountains, and then watch as the twinkling lights emerge. Fun fact: there are a series of concrete slides that will take you down off the top of the hill. Find them, it’s fun! There’s an amazing gastronomic dining destination here known as Mercado del Rio. It’s a massive warehouse in Ciudad del Rio that has been converted into a mid to upscale food court (for lack of a better word). 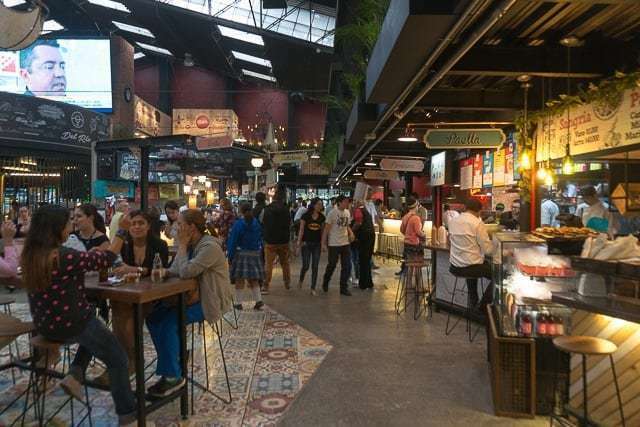 This place was a pioneer within Colombia but has since spawned competitive offshoots in Medellin like the Mercado del Tranvia (small, but still very cool) in the Buenos Aires neighborhood of Medellin or the new market in Bogota. The Mercado del Rio was modeled on places like the Chelsea Market in Manhattan, a place where patrons can come and choose from nearly 50 different restaurant stalls. Nowhere else can you find such a great variety of eats under one roof. Indeed, it can actually be difficult trying to decide on just one thing. The Modern Art Museum of Medellin (or El MAMM) is at the heart of the urban renewal and renovation taking place in Ciudad del Rio. It is partially housed in an old warehouse that has since been expanded upon with a massive modern structure connecting at the back. 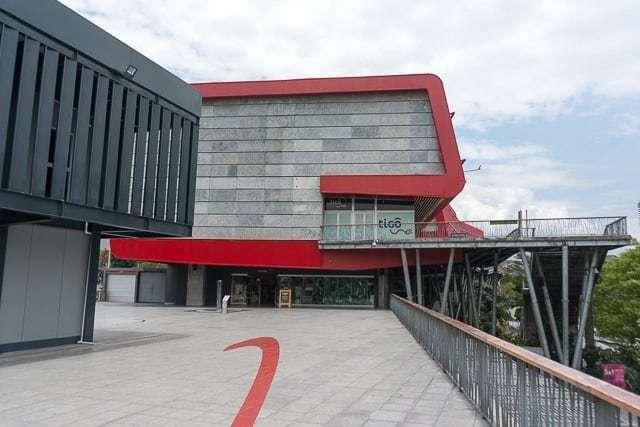 El MAMM houses an impressive collection of modern art, including work by the notable artist Deborah Arango, and a frequent rotation of temporary exhibits. The terraces on the upper floors of the museum are awesome for the view. The museum also frequently hosts open air movie nights and other events on its premises. Slip around back for a coffee at Ganso & Castor. If you’re here on the last Friday of the month, entrance is free! The famous Medellin Metro Cable… It was built as an integrated part of Medellin’s metro system in order to provide public transport to the poorer communities that live along Medellin’s upper reaches. 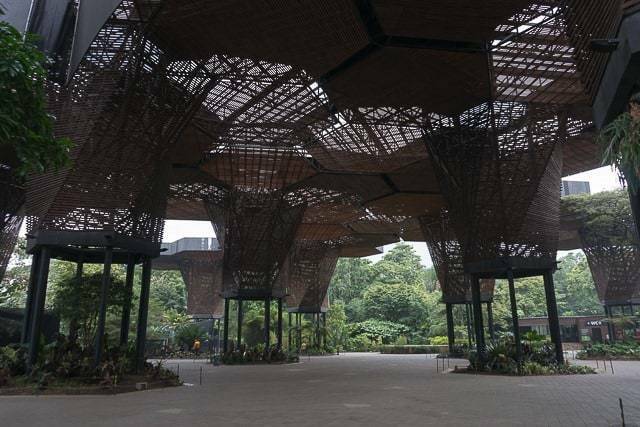 It is among the most innovative and progressive pieces of urban development (many cities in Latin America have been turning to Medellin as a model) and has inadvertently become a major tourist attraction as well. 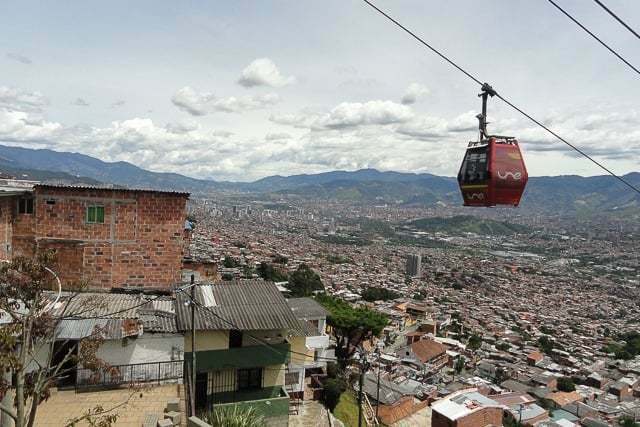 For just the price of your metro ticket, you can board the gondolas that will take you to the upper reaches of Medellin. Hope off at Santo Domingo and take in one of the greatest views of Medellin. While this neighborhood was once among the most dangerous, it has been revived by this infrastructure investment. You don’t need to worry about walking around during daytime in the immediate vicinity of the metro station, it’s quite safe. 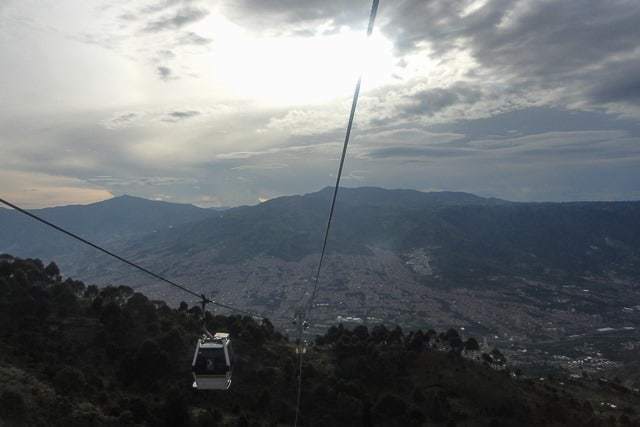 From the Santo Domingo station, you can board another gondola cable car (ticket is apart from the metro) and head deep in Parque Arvi, a large nature reserve that sits in the high slopes above Medellin. 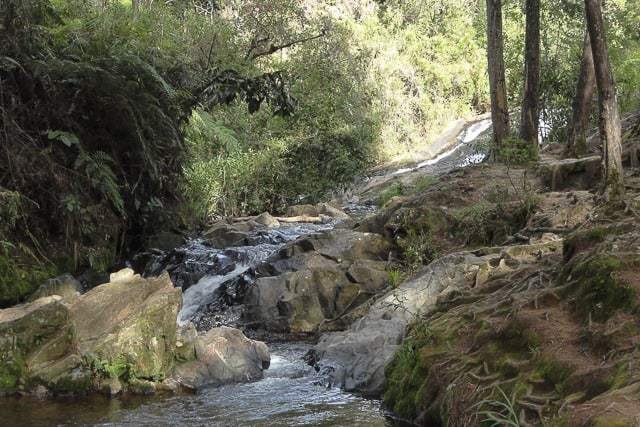 Here you will find ample hiking trails and activities like horseback riding, or you’ll find picnic areas, or streams to wander along. It’s an incredible way to link nature to the accessibility of the city through public transport. Another one of Medellin’s innovations. If the temperatures are too hot in the valley, you can head up here to escape the heat and reconnect with nature. No foreign travel experience is complete without trying some of the local cuisine. Bunuelos are fried little bread balls with cheese mixed into the dough that are absolutely delectable. You’ll find bunuelos all over town, but the trick is finding them fresh. They’ve got to be recently fried so you get that crunchy warm goodness, and not reheated which will make them lose their appeal. While Medellin is predominantly a reggaeton city, salsa is also quite popular among those who love to dance. Any one of these locations is sure to be hopping on a Friday night and you’ll see some pretty impressive moves. 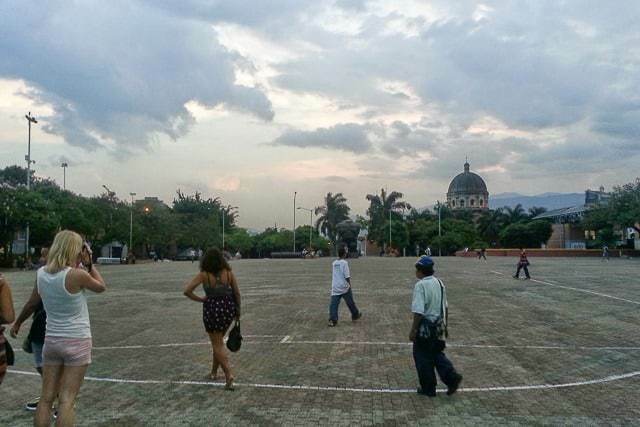 Medellin is also a great place to take salsa lessons it you’re keen to learn, rather than flail. 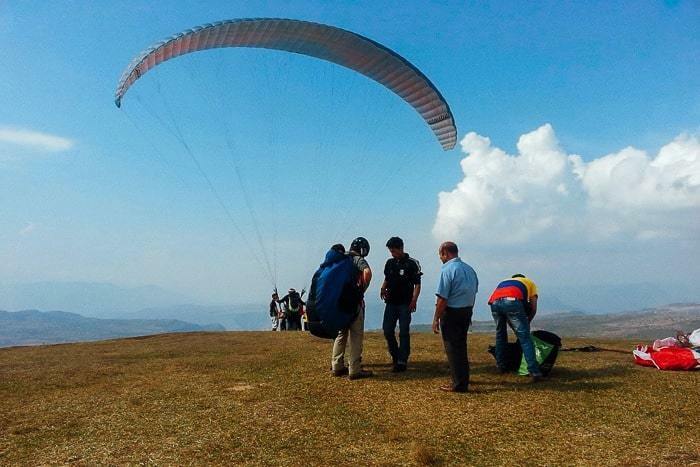 Check out some more of the awesome tours you can do in Medellin here. No list of Medellin would complete without arepas, of course. The arepa (while also common in Venezuela and Panama) goes hand in hand with Colombia. 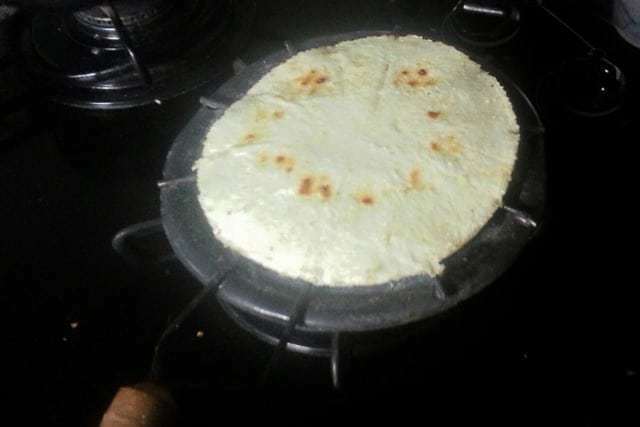 The arepa is a thick little corn tortilla that is toasted up and eaten at almost any time of day. It’s the typical breakfast of locals, toasted and served with butter and cheese. But it can also be topped with pretty much anything imaginable. You can scramble some eggs and ham and throw it on top, with rice, or whatever you want. A number of restaurants, like J&C specialize in arepas with whatever fixings you desire. I wasn’t a huge fan of arepas at first, but have grown to love them. I eat them almost every day. Arepas are a staple of Colombian food, but don’t miss my more complete guide to what to eat in Colombia here. El Castillo, the Castle, is located high on the hill above Poblado… Yes, there is a castle in Medellin, oddly enough. It was once the extravagant home of a wealthy businessman but has since been turned into a museum or park for the masses to enjoy. The interior of the castle itself is quite interesting — a peek at a different time (and socioeconomic status). But the best part here is the lovely gardens and a sweeping view of the city. 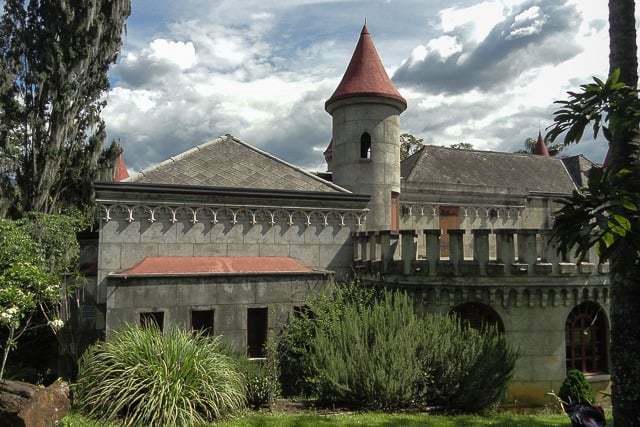 El Castillo is a great place to go on a date, or bring a picnic lunch and just hang out. You might even catch sight of the macaws that make their rounds through Medellin — they were released by the zoo once upon a time, but have adapted to life in the city. They aren’t actually native to Medellin. Like the coffee culture, beer culture is a relatively new phenomenon here as well. Most of the national brews are your typical watered down beer like Budweiser, but a number of breweries have been making in-roads both in Medellin and in Bogota. The best in Medellin, in my opinion, is 3 Cordilleras, they’ve got about five craft beers which are sold throughout many bars in town. But the most fun is to visit the actual brewery near Industriales during one of their Thursday – Saturday night open houses. For about $10 you get five beers, live music (usually rock ‘n roll), and a commemorative glass (or you can return it for a few pesos back). It’s always a great time at the urban warehouse. They even give tours of the brewery if you get there early. Another runner-up is the 20Mission Brewery near the edge of Ciudad del Rio and Manila — also pretty cool. Paisas (the name given to locals) love to party, that is undeniable. Parque Lleras lies at the center of El Poblado, the most upscale and elegant neighborhood in town, and it serves as the heart of nightlife here in Medellin. Let’s just say that this is one of the top things to do in Medellin at night on a given weekend because thousands of people pack the streets every weekend to patronize the hundreds of bars in the area. There are clubs on top of clubs and the whole scene is pretty wild. Even if nightlife isn’t your thing, it’s still a place that you should check it out at least once during your visit to Medellín. Just don’t be that traveler who never leaves El Poblado, there’s much more to this city. There are a lot of gringos out and about here, so if you want a more local nightlife scene, head to La 70 or 33. 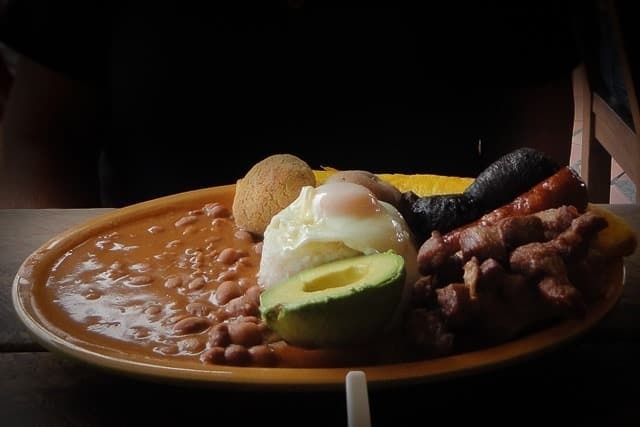 If there is one dish you must eat at least once, it’s the Bandeja Paisa (the Paisa platter). It’s a massive plate of food, with a ton of meat (sorry, vegetarians!) and is emblematic of the region. On your plate, you’ll find chorizo, ground beef, morcilla (blood sausage), chicharron, fried egg, beans, rice and more. If you get the full platter, it’s definitely a challenge to polish off everything. You’ll probably just want to go back to your hotel for a nap. Look for Donde Dario (in Belen), Hatoviejo (various locations), or Brasarepa (in Envigado, where Anthony Bourdain went), for a really good plate. The Barefoot Park as it is known in English is a cool urban space where water features are a plenty, and placed alongside sand boxes (where you are meant to walk barefoot, hence the name), and greenery like towering bamboo. 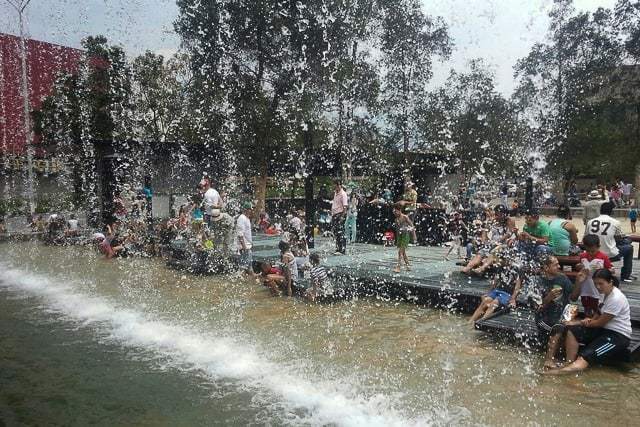 The space is incredibly popular with families, as the children use it as a personal water park on hot afternoons. But it’s also just a great place to relax, grab a bite to eat, or a fresh fruit juice and enjoy the day. Medellin has become famous for public spaces like this. Yes, the water museum, it’s a pretty off the beaten track place and not something that would immediately sound interesting, but like I’ve mentioned, Medellin does museums very well. The Museo de Agua, located near Alpujarra and the Barefoot Park is no exception. 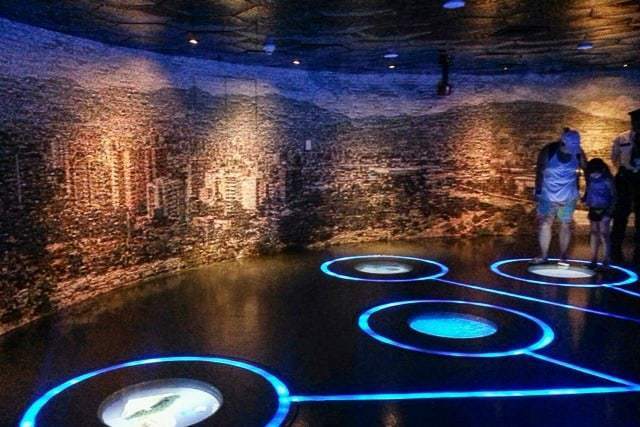 The museum focuses on how water formed on planet earth and gave birth to life, the importance of water and environmental conservation, as well as talking about how Medellín gets its water and where it comes from. There are a number of exhibits that showcase the many different ecological zones of Colombia (from the paramo to the Amazon) which provide a great overview for future travels within Colombia. It’s a cool museum, you should give it a chance, even if it’s just for a rainy day escape. Expect to spend about an hour here. Make a stop at the nearby de los Andes coffee shop or to the popular chain Tostao. Envigado is Medellin’s little neighbor to the south. They used to be fully separated cities within the valley but have since melded together as the population swelled. 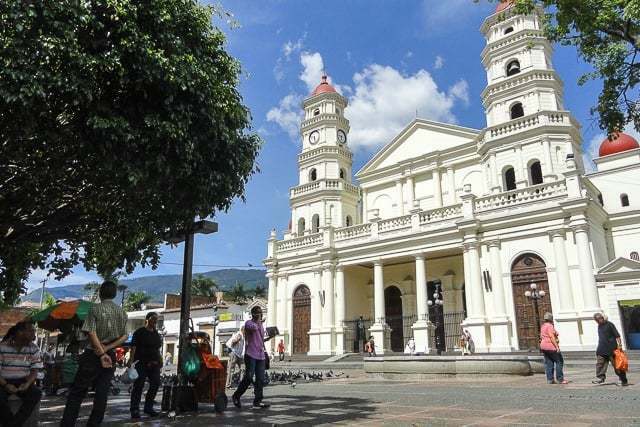 Envigado gives you a nice little taste of the typical small town, with the central square where old-men hang out sipping tinto and feeding the birds below the big white church. The area is somewhat more laid back than Medellín itself and many locals and foreigners alike prefer living in Envigado for that reason. Toward the north end, you’ll also find an upscale dining area known as Jardines, where you can explore some of the most famous regional restaurants like La Doctora or El Trifasico, where the former President of Colombia himself goes to eat whenever he is in town. 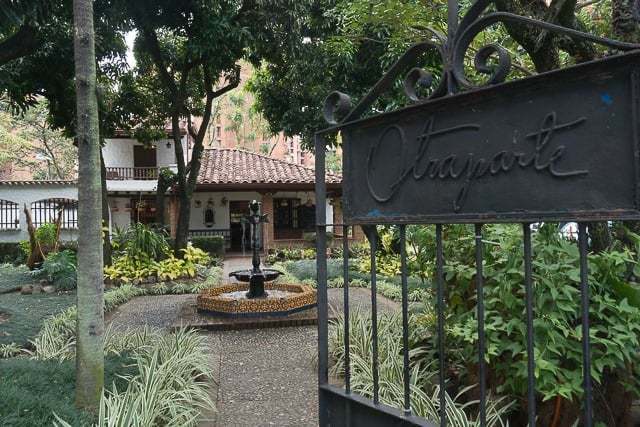 Casa Museo Otraparte, located in Envigado near Jardines, is the former home of an important Colombian writer and philosopher known as Fernando Gonzalez. While the museum itself might be of limited interest to foreign visitors, the idyllic gardens are another great retreat. The on site coffee shop is one of the best in town. They also host many cultural events ranging from movie nights, to lectures on art, music, and more. It’s a great space and it’s totally free. This was where I went to the free coffee cupping that I mentioned earlier. Though ajiaco is originally from Bogota, it is still a popular and easy to find dish here in Medellin. 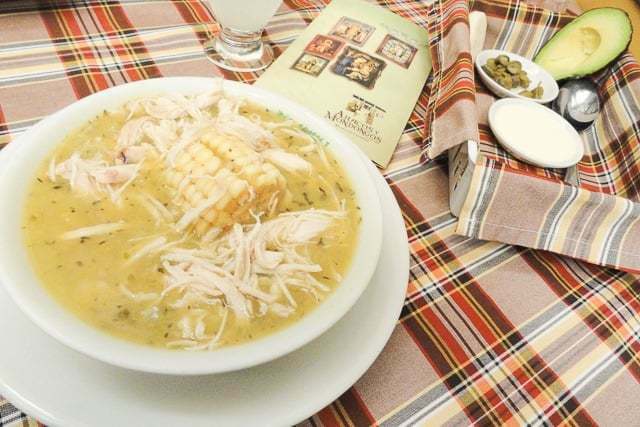 Ajiaco is like the local version of chicken soup with a few varieties of potato, a chunk of corn on the cob, and capers mixed in. I love ajiaco, it’s one of the best foods in Colombia, I think. 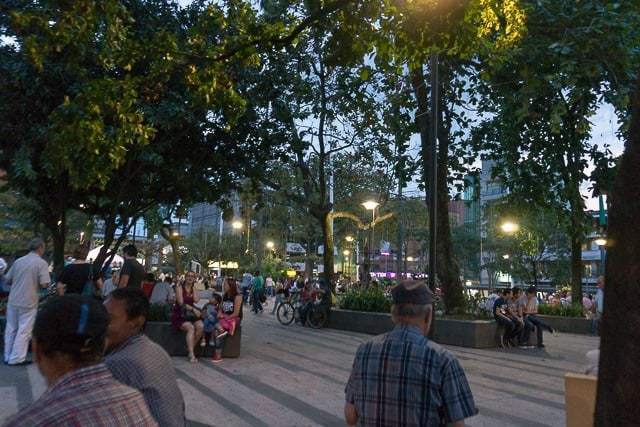 Also known as Plaza Cisneros, the Park of Lights is another one of Medellin’s innovative public spaces. It is located directly across from the government administrative center of Alpujarra, and was once a crime infested and dangerous part of town, rampant with drug use and prostitution as soon as darkness fell. The government decided to turn the lights on literally by installing tons of artistic light towers that light up and change colors throughout the night. While the effect is obviously best enjoyed at night, it’s still a cool place to walk through during the daytime. Look up and take a picture. Colombians LOVE soccer. Well, I guess pretty much everyone loves soccer except for us Americans. Attending a raucous game at the stadium is an unforgettable experience as you see the fans giving it everything they’ve got for 90-minutes while players run back and forth across the field passing the ball and almost nothing happens (but that’s soccer for you, ha). 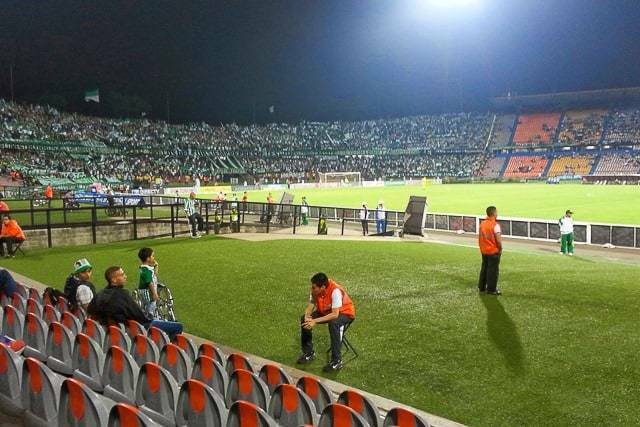 There are two teams in Medellin, Atletico Nacional or DIM (just known as Medellin). The teams are rivals, so you’re either a fan of one or the other. Nacional is the most popular (and more successful) of the two. Any game is fun to attend, but you can be sure of a super intense game if the two play against one another, known as a superclasico. Sit along the sidelines if you want a more normal experience, or sit behind the goals if you want to be part of the intense experience with the super fans. Aguardiente, literally translated means fire water and it is the local drink of choice here in Medellín. It’s an anis based drink, giving it the flavor of black licorice, or ouzo, or Jagermeister. 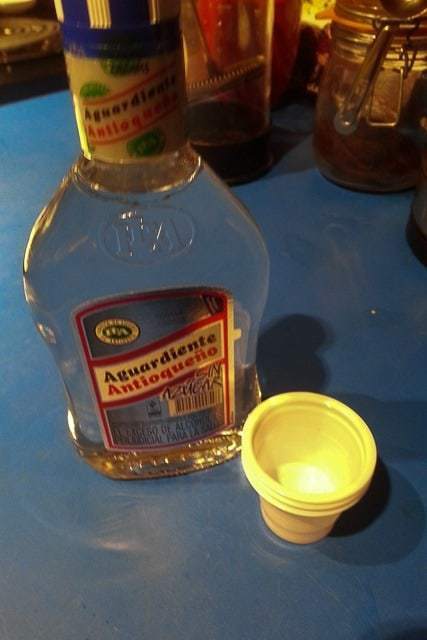 Locals will buy a bottle (or two) of Aguardiente Antioqueno and sit around all night doing little shots. I’m not a fan of black licorice, so it’s not my thing. But it’s fun to go out with the locals. You can get either Tapa Azul or Tapa Roja — the blue top is without sugar and thus supposedly won’t give you as bad of a hangover. It’s pretty much the cheapest drink in town besides the $1 beers. The Feria de las Flores happens only once a year, every August, but it’s an event that is so important and emblematic of Medellin, that you can’t miss it if you’re in town then. The Silleteros, the flower carriers, create massive arrangements of flowers in all sorts of designs and styles. The artistic flower creations are mounted on a heavy wood display and then strapped to their backs as they parade these heavy things around town. The streets pack with people who come to see this once a year event, and it is pretty cool to see, certainly unique to Medellin. Although you feel sorry for the little men and women under the crushing weight of these flowers, marching under the hot Colombian sun. Empanadas are those delicious fried pockets of meat, rice, or potatoes that you can see being sold on every street corner. The empanada of choice here are the empanadas envigadenas, ie from Envigado, which became famous locally for being so good. I usually get empanadas at least once a week, it seems. Though be careful, they aren’t the healthiest things (usually the tastiest things aren’t). You also can’t go wrong with the pasteles de pollo (meat pies) that they sell around town, there are both fried and baked versions. Personally, I prefer the baked ones. 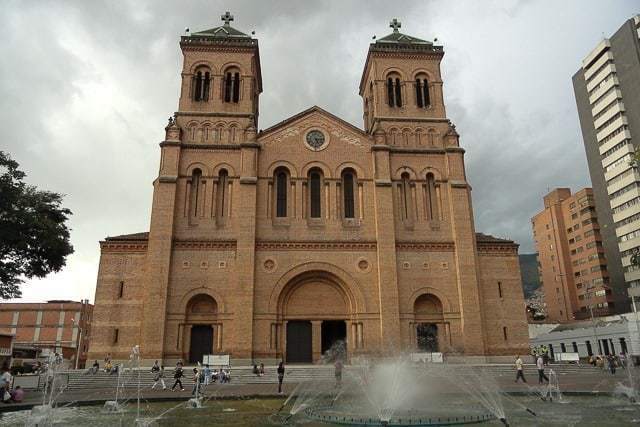 At the heart of downtown, you’ll find the Metropolitan Cathedral, which is the largest oven-baked brick church in the world, purportedly. While the church exterior isn’t opulent, it is an imposing church, and it sits on the edge of yet another beautiful urban plaza. 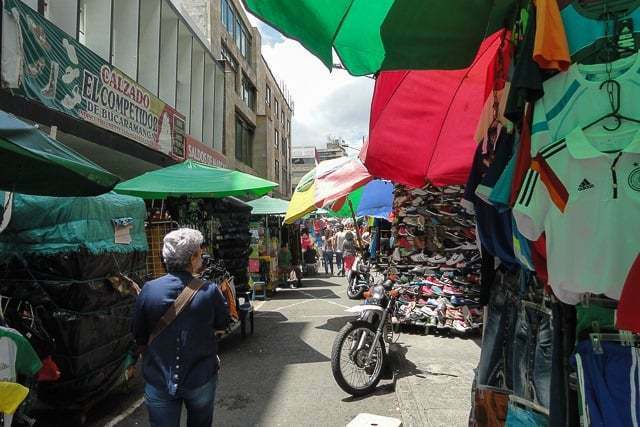 Directly south of the Cathedral, I’d recommend taking a stroll along the famous Junnin Street, a pedestrian only shopping area that has become so emblematic of Medellin that “junninear” became a local verb that means window shopping. Along Junnin be sure to stop at Astor Reposteria for the best bakery in town. The chocolate cake is absolutely incredible. You’ll thank me later. Also, if you happen to be here on the first Saturday of the month, there is a massive and awesome open air market with all sorts of handmade goods, antiques, art, crafts, edibles, and more. It is the biggest and best of this type of market, so be sure to head to Plaza Bolivar if you’re here on one of those Saturdays. El Hueco translates as “the hole” and it is a busy market located in the center of downtown, just south of Plaza Botero. Here you will find a series of city blocks that have been taken over by a ton of vendors selling all manner of goods from their little carts. Here you’ll find clothes, shoes, hats, and all sorts of things. Supposedly the market began as intrepid vendors left the sidewalk and set up shop in the street, effectively closing it off to traffic. Once one person did it, everybody followed suit, effectively creating a large pedestrian only shopping area. As you walk among the stalls you’ll hear the locals repeatedly saying “a la orden” (at your service) and inviting you to take a look at what they are selling. You can get really cheap prices here, even cheaper if you’re open to haggling. Stop in at the nearby Hare Krishna restaurant for an awesome vegetarian lunch. 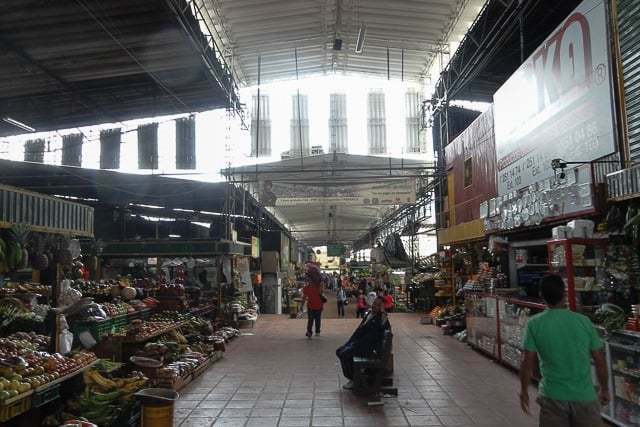 La Minorista is the largest public market in all of Medellin. It is housed principally in a massive warehouse where you will find every type of food, fruit, veggie, and meat imaginable, as the interesting smells intermingle. 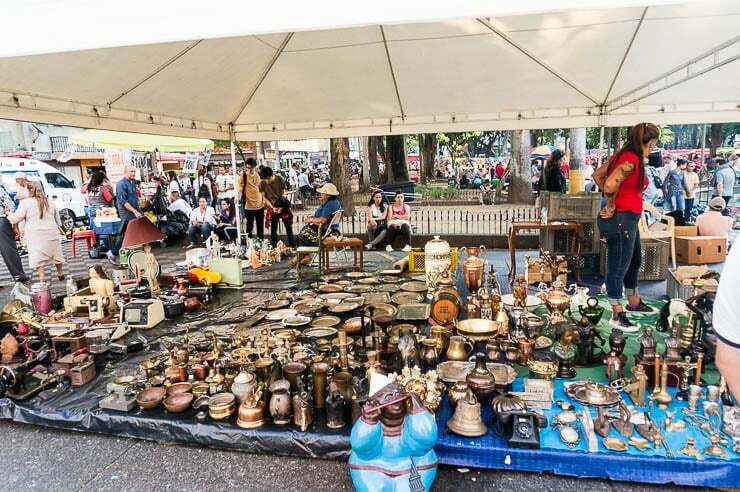 But the market also expands into other adjacent buildings where you will find everything from household goods, to animals for sale, to furniture, to electronics. They’ve truly got everything here in La Minorista. Prices can be incredibly cheap here, if you know what you’re doing. Mostly it’s just a place so very different from anything you’ll ever see back home, and it makes for a fun adventure. Come here on a weekday or Saturday (downtown can be especially lonely on Sundays) and you’re bound to see a bustling and interesting place. Medellin is a city of contrasts. Nothing could be more different from La Minorista, than the Santafe Mall, a luxurious and upscale shopping destination located near the Golden Mile — Medellin’s most upscale strip of real estate. 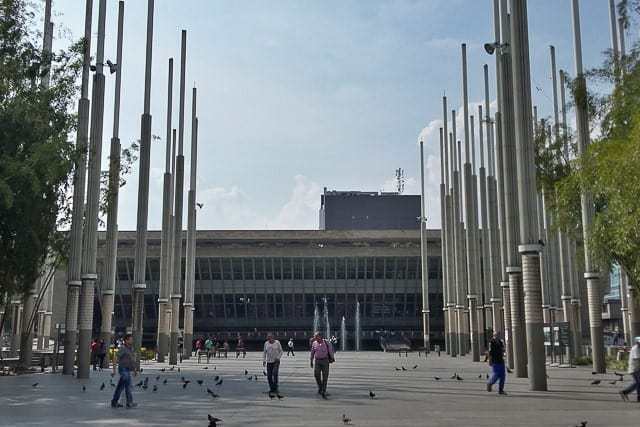 I’m not a big fan of malls, generally speaking, but the locals here truly love malls, so you would be missing out on an important part of Medellin by not going. Indeed, there seem to be more malls here (all of them packed) than any other place I’ve been. The popularity of malls here can also be attributed to the insecurity, as it is one of the few places where locals can go and let their guard down against violence, robbery, theft, etc. It is a place where families go for the entire day, a place where the kids play, shopping is done (sometimes, mostly it is just to be), entertainment is had, and good food is eaten. As I said, I wouldn’t normally recommend a mall in a travel guide, but going will give you an important insight into everything that locals have had to endure as a result of drug violence and rebel activity. Santafe is a massive complex with hundreds of stores and is among the most impressive malls I’ve ever seen. Incredibly, the central courtyard actually has a retractable roof for those sunny days in the City of Eternal Spring. I suppose this isn’t something to do in Medellin, since I’m telling you to leave, but any visit to Medellin should include a day trip (or weekend trip!) to one of the many beautiful pueblos that surround it. It’s something that many locals partake in as well on the weekends. My two favorite nearby pueblos are Santa Fe de Antioquia and Guatape. 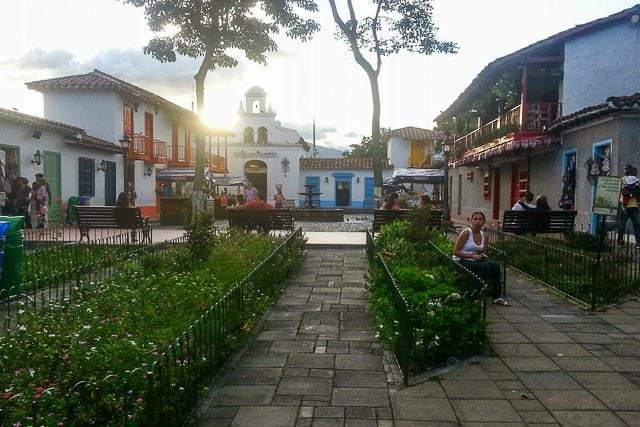 Santa Fe de Antioquia is located to the west, through one of the longest tunnels in South America, and features beautiful colonial architecture and cobblestone streets. It is considerably hotter than Medellin though, so keep that in mind. Guatape is located in the opposite direction, up in the slightly cooler mountains, east of Medellin. Here you’ll find the towering rock monolith known as La Piedra del Penol, which you can hike up the 800 or so stairs to the top. There’s also a massive lake on the grounds, a colorful little town, and lots of activities to do here. 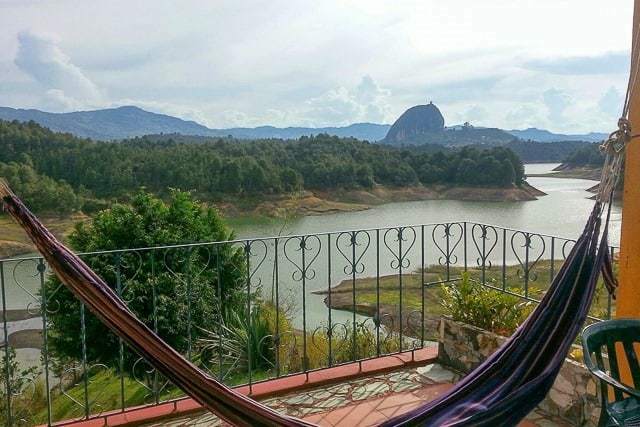 Both are fun, but Santa Fe is more hot weather and hanging out by the pool and Guatape is interesting activities and beatiful views. And finally, the ONE thing I said you should NOT DO while in Medellin… Please, don’t patronize the Pablo Escobar tours here. With the influx of Western tourists who only know Colombia for cocaine and Pablo Escobar, a number of businesses have cropped up catering to these tourists. They tend to glorify Pablo and take you to visit things like his grave, the house where he was killed, etc. One tour will take you to visit Pablo’s brother, who was complicit in Pablo’s crimes, so you can have coffee with him and take happy selfies. Let’s talk about Pablo Escobar first of well… Remember, he was a terrorist who nearly destroyed Medellin, killing thousands of people in the process, and throwing the reputation of an entire country into the gutter (even until today). For most Colombians, Pablo Escobar a figure as hated as Osama bin Laden, someone who has done incalculable damage to the country. The only Colombians that idolize Pablo are the poorest and most uneducated among them (or those making money selling shirts, souvenirs, or tours to visitors). Pablo is not just some rebel gangster like Al Capone or Michael Corleone. We aren’t talking about prohibition era hijinks or Hollywood movies. Many Colombians still live with painful memories of the bombs and bloodshed left by him. I went into more detail about why you shouldn’t patronize these Pablo Escobar tours in a follow up article, so check that out. 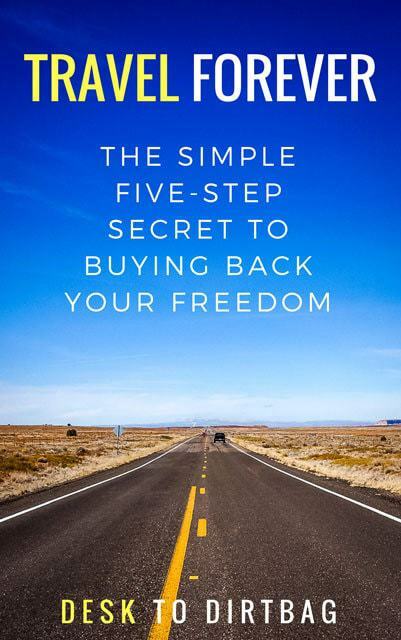 Honestly, you can learn more from a book, talking with locals who lived during that time, and visiting some of the locales on your own — and all without rubbing salt in the wound of locals or patronizing people trying to make money off his infamy. So there you have it, my definitive guide to what to do in Medellin, Colombia. 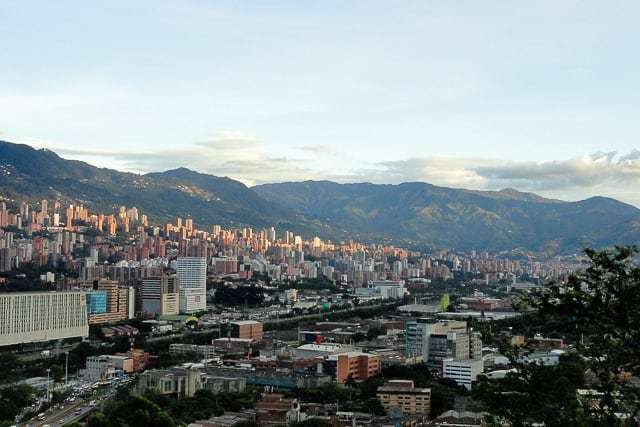 I hope it proves helpful to you during your stay in Medellin, an absolutely incredible city that I love living in, although there are a few things I hate about Colombia. 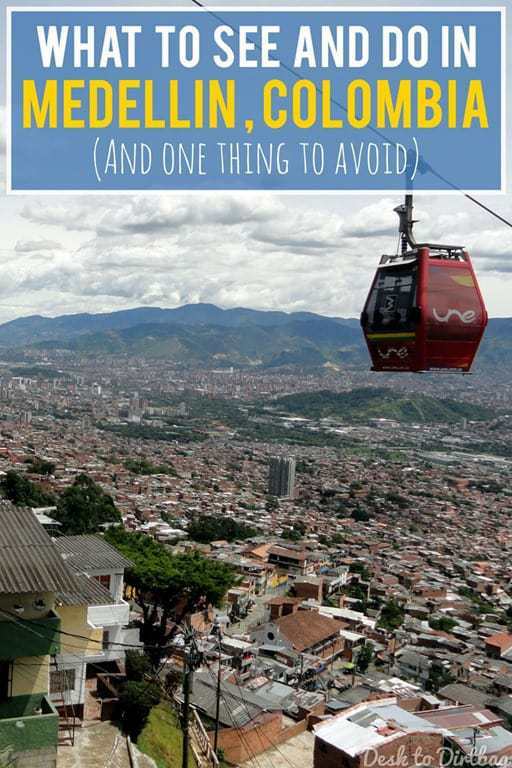 In order to boil this big list down into something more manageable for short visits, here is my top 10 guide… Or be sure to check out my itinerary for 3 days in Medellin which will give you a better idea of how to combine everything together. Now that you’ve decided on coming to visit this city, you are probably wondering where to stay in Medellin… There are a few main neighborhoods where most travelers stay and each one has a different sort of character or vibe. The most popular tend to be Poblado, Estadio, Laureles, and Envigado. If you want to stay in the more upscale Poblado, my #1 pick is Los Patios Hostal Boutique in the Manila sector. If you enjoyed this post about things to do in Medellin, please take a moment to share it on Facebook, Pinterest, or Twitter. Thanks! 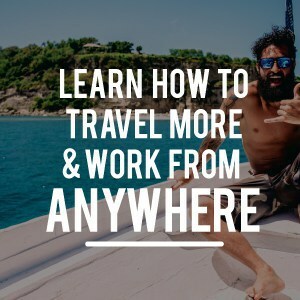 Question: How do you get around from place to place? Is there a bus on each corner or is a cab reasonably cheap? Thanks! Hey Jay — cabs are everywhere and quite cheap, if you have a SIM card, grab Easy Taxi (or Uber). I generally get around by buses though, they are super cheap (like 60 cents) and will take you everywhere you need to go, but you’ll need to ask which buses to take. For things right on the main drag, you can’t go wrong with the Metro system. I’m working on a new sort of “logistics” guide to Medellin that should be publishing soon — stay tuned! Thank you for this informative article. 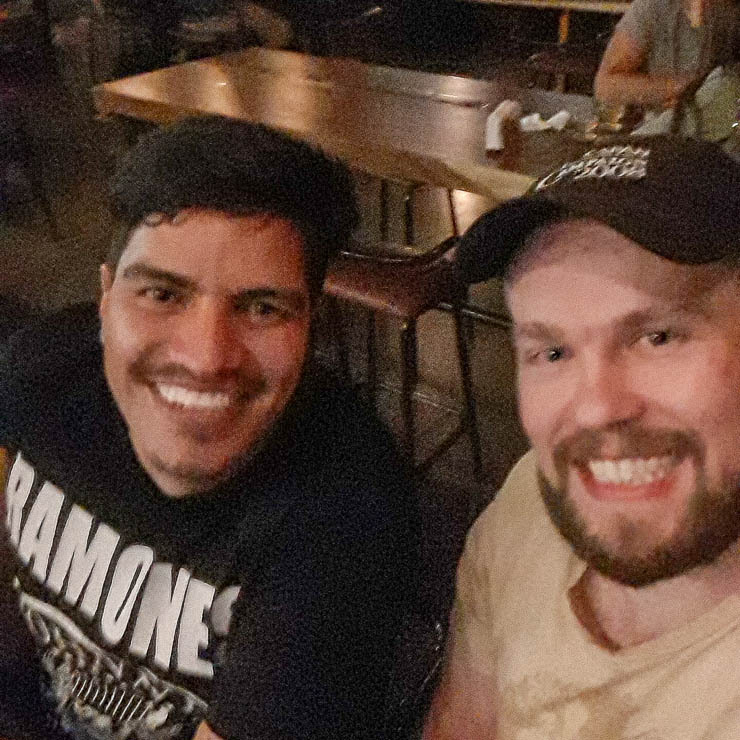 My husband and I are considering a trip to Colombia this summer and have a question. We would be bringing our two kids (ages 8 and 13). They are pretty good travelers. It sounds like there are a lot of things to do in and around Medellin that they would enjoy, but would the average tourist parent feel uneasy taking transit to the sights? Also, are you aware of any other Columbia travel bloggers who are parents? 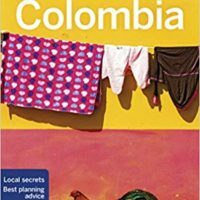 I’m not personally aware of any family travel bloggers that have written about Colombia, but I’m sure they are out there. I just don’t really follow other travel bloggers, really. 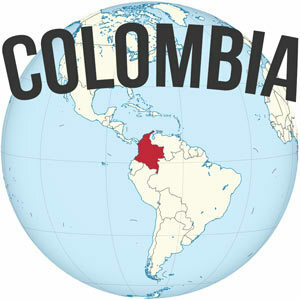 I’d love to hear about your trip if you come to Colombia. Great article. Just came back from a visit to Medellin. I could relate to a lot of what Ryan writes in this article. Awesome to hear! Hope you had a great time… I just returned back to Medellin recently. Medellin city is full of danger, While Prof.Dr. Ramo Gencay was dancing salsa, He was kidnapped and killed by bandits at December 6, 2018 . He had two children. Yeah, I’ve been following this story for a few weeks… Terrible news. One should always be on alert here, especially when it comes to the nightlife here. Do you have to buy a metro ticket every time you get on or is there a day pass type fare? Great article. I have not been in this city for many years now. I will be taking my family there for the holidays and it was great to read how much it has changed. I am Colombian and my family lived there during Pablo Escobar era (I was a kid), and thank you for pointing out those tours and advising people not to do them. A lot of people think that he was a hero but in reality he hurt this beautiful city so much. Great article, really comprehensive and interesting! I’ve made a note of all these places (and food) for when I visit next month. Interesting about the Pablo Escobar thing – I had some friends recommend doing this tour, but I thought it didn’t seem quite right. I need better friends. Thank you for this Article, SPECIALLY the Don’t patronized Pablo! I am a Proud “paisa” living in the US, I really appreciate that! Great article, I needed ideas since I’m taking some friends to Medallo during the summer 2018. Glad to hear that the article was helpful! Enjoy the return to the homeland. I just left Medellin a week ago and had a great time, as always. Thanks for a great article Ryan! I’ve just arrived and this has been a huge help in figuring out what to see (and not..) while in town. To visit the majority of this list how many days you think it could take? Also any city tour company that you know or recommend? I’d give it at least 4-5 busy days of sightseeing, although you would probably be better served by a week. I don’t have any city tour company recommendations, beyond the free walking tour mentioned. Hope you have a good trip. Plan on visiting in June.. Your info should help me get the most out of a week stay. 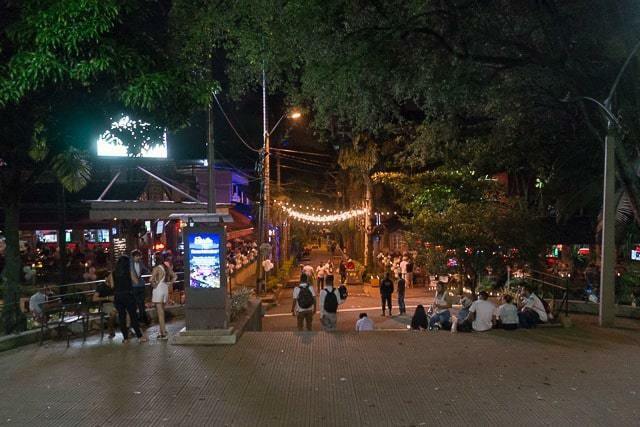 Parque Lleras is the center for night life, which is located in Poblado. The two other big areas are La Setenta (near Estadio) and 33 (between Laureles and Belen). Lleras is the biggest scene. I don’t have many specific reqs there, but we enjoyed going to Blue. I’m more familiar with the Laureles area, so both 70 and 33. See my detailed article about Laureles for nightlife stuff too. Thanks Ryan, awesome list. I came to Medellin without much prep and have seen so much more than I expected by following your recommendations. A really useful article which is quite rare on the Internet. Awesome, so glad to hear Andres. Hope you had a most excellent time in Medellin. Thanks for the information. I am planning my first trip to Colombia and wanted to get your thought if we should visit Medellin or Bogata. We do have some friends in Pereira that we want to visit. Let me know what you think. Depends on what you’re looking for, but if you can only visit one, I’d personally pick Medellin over Bogota. But if you want more of the big cosmopolitan city and high Andes culture, then Bogota is your best bet. What are your recommendations in terms of transportation around the city? Also, are there visitor’s kiosks anywhere where individual travelers can get information about bus lines and such? Many thanks! The Medellin metro system works great, in my article on Laureles I talk quite a bit about transportation and getting around, including the buses, so be sure to check that out. I think this is a nice article.. except i don’t agree on the Pablo Escobar thing..
I’m not a drug-user nor a drug-tourist and still this tour gave me a lot of information about the TRUE story… I can imagine there are some touroperators that are just telling the netflix-story people want to listen to. But don’t be judgemental about all the tours if you haven’t done one yourself. If at any place in the world you should take a tour with more information about this criminal then I think you should do it here. Or do you think people should stop visiting Auschwitz too because people try to make money on bad things that happened there? Offcourse they take you to his houses, the tour would be really weird if they walked around in parque arvi and just told the story knowing Medellin is full of proof of what he has done..? Don’t you think the real place to avoid should be Parque Lleras? this is the real tourist trap.. I think that an Auschwitz visit is totally appropriate. The difference here would be if foreigners were going on a “Hitler Tour” following the success of a wildly successful Netflix series about Hitler’s life, where they get to take selfies with Hitler’s grave or the tour culminates in coffee and cookies with Hitler’s brother, or one of the leaders of the Nazi party like Himmler (aka someone who was complicit and instrumental in the horrors unleashed), where they again take big smiley selfies with him and get to ask him inane questions in broken German about their wacky war criminal adventures with Hitler back in the day. But even so, that would be different, because most of the people targeted by Hitler fled Germany for Israel, the US, and elsewhere, and aren’t still living in the place where it all happened and are then confronted daily with foreign tourists flocking to the city to patronize these tours so they can walk in the footsteps of Hitler, leave things on his grave, meet his henchmen, and buy t-shirts with Hitler’s face on the front. There’s no perfect analogy for these Pablo Escobar tours, because virtually no one glamorizes war criminals but there is plenty of glamour for drug kingpins. 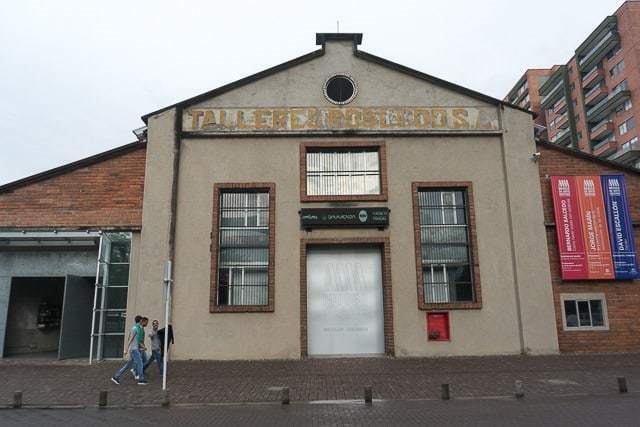 In my opinion, Medellin should have a memorial or museum (like Hacienda Napoles) in the city where tourists can visit and learn more without going on a tour. The fact is that most Colombians (except the poor who idolize him and the agencies and operators peddling Pablo tours) would agree that foreigners patronizing these tours is kind of a slap in the face. 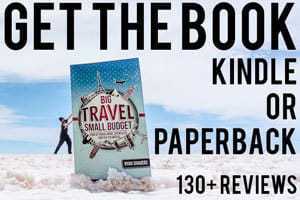 You can learn a lot more from a book, talking to locals who lived through that period, and yes, even visiting the sites yourself if you deem it important to your understanding, and you can do all that without rubbing salt in the wound of locals or lining the pockets of tour operators making money off his infamy. Thanks! Yeah, there is so much to see and do in Medellin, it is truly an incredible city, often overlooked by many international travelers.